I've been manufacturing car care products for the last thirty years, with Detailer's Pride being my first foray into the world of surface care enhancement. It was, after all, a product line that I could call my own, because it was developed by my team of chemists to my discerning standards. I continuously updated this line, and it eventually became Detailer's Pro Series, or DP for short. Paint systems continue to evolve, as do the needs of car care enthusiasts. Being in this industry every day for thirty years, I know in order to stay on the cutting edge of surface care enhancement, you have to continually update formulas and adapt to new trends to retain the interest of discriminating car care enthusiasts. That leads me to my latest venture, McKee's 37. Developing world-class car care products is nothing new to me. For years I was the co-owner of Pinnacle Natural Brilliance, before I gained 100% control. I created Black Label, a cutting-edge division of Pinnacle, from a clean slate. I acquired BLACKFIRE Car Care from a long-time friend and competitor. Marine 31, as my neighbors who enjoy boating life as much as I do, said they were surprised it took me as long as it did to create my own line of marine-specific of cleaners and polishes. I created Wolfgang Car Care from scratch too. McKee's 37 is arguably my greatest undertaking yet, and there's no doubt it's the line I'm most proud to call my own. McKee's 37 aims to synthesize the knowledge gained from the development of the Detailer's Pro line with the latest technological breakthroughs in surface care to create a full line of effective and affordable products. During my thirty year stint in this industry, I've developed hundreds of waxes and polishes that were, for the most part, only obtainable by those with high-end tastes. Thanks to advancements in surface care enhancement technology, my team of chemists was able to develop an affordable line of products that offers world-class performance. Each and every formula in the McKee's 37 line is worthy of being used on the world's finest show cars, but still obtainable for the everyday driver. Through years of painstaking research, trial and error, and countless reformulations, my team and I were able to create a complete line of world-class waxes, cleaners and polishes that easily holds its own with any product on the market. This line, after all, has my name on it, so the formulas had to be the best. McKee's 37 will exceed your expectations � I guarantee it. 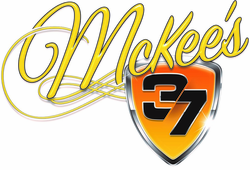 From the incredibly simple glass cleaner that leaves glass clean and streak free, to the state-of-the-art paint coating that provides tough-as-nails protection that lasts years, the complete line of McKee's 37 will be among the best you've ever used. If it wasn't, I wouldn't have my name on it! McKee’s 37 Trademark Extender Spray Wax 128 oz. McKee’s 37 Trademark Poli Coat Wax 128 oz. McKee's 37 Fast Water Spot Remover 128 oz. McKee’s 37 Leather Shampoo 70/30 128 oz. McKee's 37 Hydro Blue Concentrate - 128 oz. McKee’s 37 N-914 Rinseless Wash 128 oz. McKee’s 37 Sio2 Auto Wash 128 oz. McKee’s 37 Paint Coating Bundle - New Formula! McKee's 37 Tire Shine SiO2 Enhanced - 128 oz. McKee's 37 Frost Bite Ice & Snow De-Icer - 128 oz. McKee�s 37 Anti-Frost Windshield Washer Fluid 128 oz. McKee’s 37 Hydro Blue Sio2 Coating 128 oz. McKee�s 37 FAST Interior Detailer 128 oz. McKee�s 37 Floor Mat & Cargo Liner Rejuvenator - 128 oz. McKee’s 37 Hi-Intensity All Purpose Cleaner Plus 128 oz. McKee’s 37 Wax Remover for Plastic 16 oz. McKee�s 37 Xtreme Iron Remover -New Formula! McKee’s 37 Universal Detailing Clay 4 oz. McKee�s 37 Tar Max Tar Remover - 128 Oz. McKee's 37 Coating Prep Auto Wash - 128 oz. McKee�s 37 Waterless Wash Kit 144 oz. Mega Value!